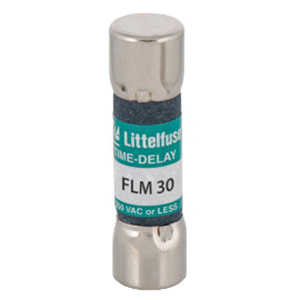 Littelfuse FLM Series Slow-blo time delay fuse is rated at 250-Volt AC/125-Volt DC and 30-Amps. Interrupt rating of this fuse is 10-Kilo-Amps at 250-Volt AC. The midget fuse of dimension 0.406-Inch Dia x 1.5-Inch, has cartridge shape body. It offers response time of 1 hour maximum at 135% and 5 seconds minimum at 135% rated load. Holder mountable fuse is suitable for protecting control circuit transformers, solenoids and other circuits with high inrush current. Fuse is UL listed and CSA certified.